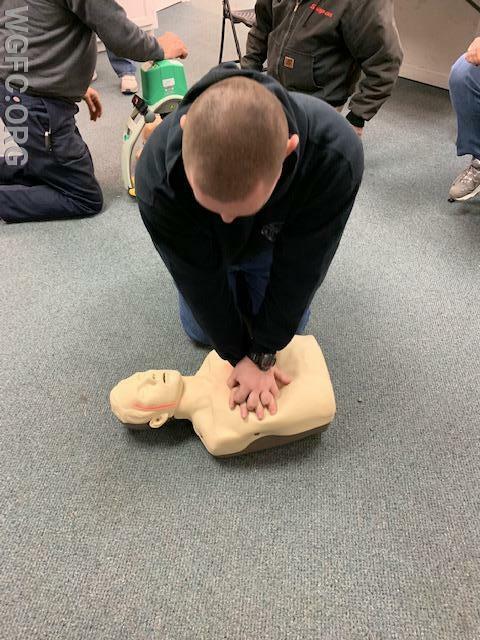 More than fifty West Grove Fire Company firefighters and EMTs participated in a training program this evening designed to refresh skills in emergency medical services and CPR. The training is part of the WGFC's annual refresher training series, held at the beginning of each year, covering topics that impact most members and employees, across various emergency situations. This week's Monday night training was EMS related, and follows last week's training on hazardous materials. 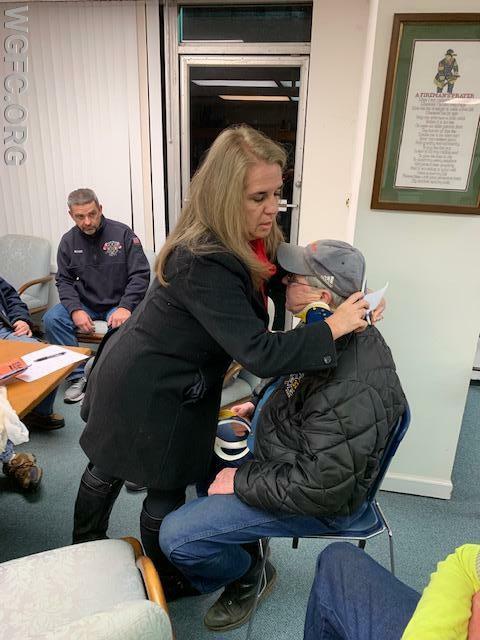 Tonight, participants went through four stations: CPR for children and babies; adult CPR techniques, along with choking; first aid techniques; and an overview of the WGFC ambulances. Four groups rotated through the stations over two hours, and participants had hands on instruction and demonstrations, and then each member showed proficiency on required skills. At the infant and child CPR station, realistic training mannequins allowed for practice on breathing and chest compression. 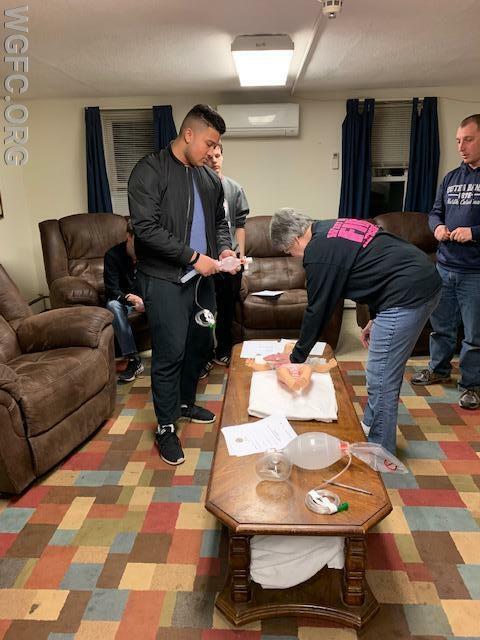 At the first aid station, participants handled modern tourniquets; discussed operation of AED devices and how to use them on cardiac patients; reviewed the use of Narcan for opioid drug overdoes, and worked on various techniques for splinting and immobilization. 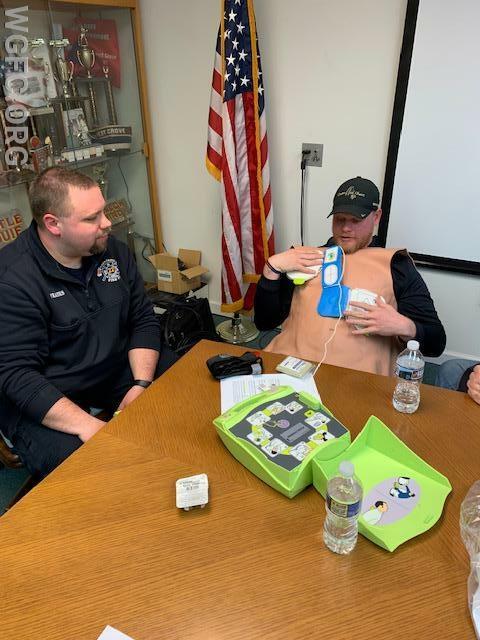 At the adult CPR station, students demonstrated how to do chest compressions at the right rate and depth; how to set up and use an automatic Lucas chest compression device, and how to handle choking situations. And, in the ambulance review, participants checked on the location and operation of a variety of portable EMS equipment. Firefighters play an important role in supporting EMS in patient care, packaging and transport. This annual refresher keeps our members and employees up to date on the latest protocols and practices, and assures we can best respond to any emergency in the greater West Grove area. The WGFC has an admirable record and commitment to training, with members and employees involved each year in hundreds of hours of training -- at the stations, in county courses, and at the state and national level. Participants demonstrate infant and child CPR techniques. Practicing applying a cervical collar. Students demonstrate the proper placement of AED equipment for patients suffering cardiac arrest. Participants worked in teams of two to use the Lucas device (for automatic CPR) while also showing skills with breathing techniques. 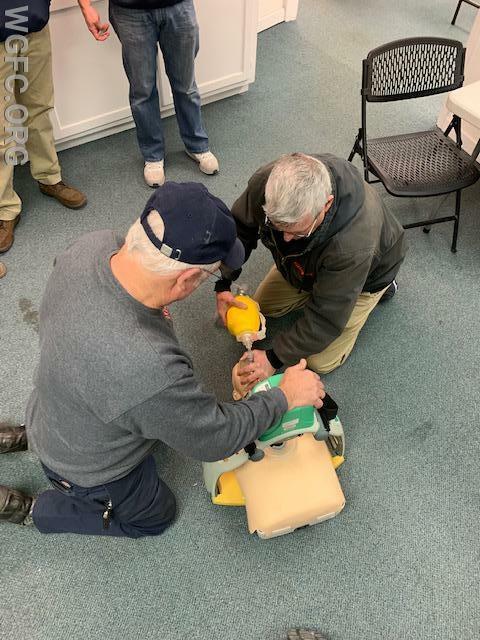 Nearly 50 WGFC members and employees participated in an annual CPR and EMS refresher training at Station 22.